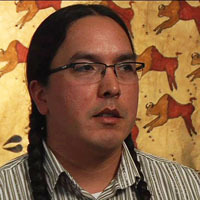 Sean Chandler is the director of the Native American Studies Department at Fort Belknap College in Harlem, Montana. His interview focuses on the tribal history project at the college and its goal of reaching out to both the Indian and non-Indian communities in an effort to eliminate stereotypes and clarify the historical record. Gros Ventre and Assiniboine Tribal History Project - Sean Chandler.